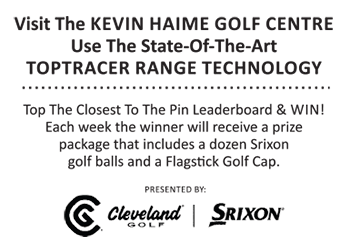 It is safe to say that the most common, most frustrating issue for the average amateur golfer is the ball flight that will forever be known as the slice. For those that suffer from it’s debilitating effects on the golf course, the slice can seem like a disease without a cure. Usually, after much experimentation and frustration, players will give up on trying to fix their slice and resort to painful acceptance, ie. aiming 50 yards to the left or right (depending on the golfer’s dexterity) and allowing the ball to ‘curve’ back to the desired target. While this strategy might keep a few more golf balls in your bag and out of the woods, it is simply a band-aid that will end up costing tons of yardage and will ultimately stand in the way of you becoming a better player. Fortunately, the slice is not an impossible fix. Most players struggle with fixing the slice not because it is a complex issue, but because they do not understand what is causing the ball to slice. Whether the ball is heading left or right, it is the spin that is causing the ball to move. So what is causing the spin? For the purposes of explaining, let’s say the player is right-handed. Generally, the ball slices (moves severely from left to right) when the player makes impact after coming at the ball from the ‘outside’ of their target line. Figure A (above) is an illustration of what this looks like … players will come at the ball from the outside on their downswing (shown by the red line), coming across their target line (shown by the green line), putting ‘left-to-right’ spin on the ball. While this is somewhat of an over-simplification of the slice due to the fact that we have not discussed the effects of face angle (open vs closed vs square), my experience as an instructor has shown me that the first and most important step in curing the slice is the correction of the improper swing path. While fixing the slice isn’t impossible, it can be difficult. Generally, this “across the line” swing path is so engrained in a player that it can be extremely challenging to change. Yes, you can watch the Golf Channel and search the internet for expensive tools and aids that will help you, but there is a much simpler, cheaper fix. See Figure B (Above). Place your headcover on the outside edge of your target line. If you fall into your old habit of coming at the ball from the outside, you will strike the headcover with your clubhead. If you swing on your desired path, you will miss the headcover and make clean impact with the golf ball. This drill offers immediate and beneficial feedback that will allow you to begin to feel the proper swing path. Give it a shot!